Kendrick Lamar’s new “ELEMENT.” video is striking, but it’s also much more than that. Beyond its stunning imagery, the video doubles as an homage to the legendary photographer Gordon Parks. In 3 minutes and 33 seconds, co-directors Jonas Lindstroem and the Little Homies (comprised of Kendrick Lamar and Dave Free) referenced some of Parks’ most remarkable work, all while making a statement of their own. It’s fitting that K. Dot chose to honor Parks, who passed away in 2006 at the age of 93. After all, both artists have been praised for representing Black excellence through their uniquely personal lenses. Both are transcendent in their fields, providing poignant commentary on poverty, politics, and social justice. Kendrick does it through hip-hop, with his lyrics and visuals. Parks did it as a photographer, filmmaker (Shaft), writer (A Hungry Heart) and composer (Half Past Autumn Suitewith Irvin Mayfield). Parks did all of that while breaking barriers. He was the first Black director of a Hollywood studio film (The Learning Tree). He was also the first Black photographer to work for LIFE and Vogue. Through all of this, he was able to capture the human experience, from the streets of New York to the favelas of Brazil, from Malcolm X and Muhammad Ali to Marilyn Monroe and Oprah Winfrey. By referencing Parks throughout “ELEMENT.,” K. Dot opens up a new generation to his timeless work. This is how he did it. Lamar’s tribute to Parks is evident from the opening scene (0:03), when a hand slowly emerges from cool, blue water. It’s almost identical to an untitled photo that pops up twice in Half Past Autumn: The Life and Work of Gordon Parks. It’s also reminiscent of the outstretched hand on the cover of his 1971 book, Born Black: A Personal Report on the Decade of Black Revolt. It’s this type of carefully-constructed recreation that begs dissection and it sets the stage for other references to explore childhood, violence, race and religion. Childhood and race are major motifs throughout “ELEMENT.” Just peep the scene where a tied-up june bug crawls on a young Black man’s forehead (at 0:39). 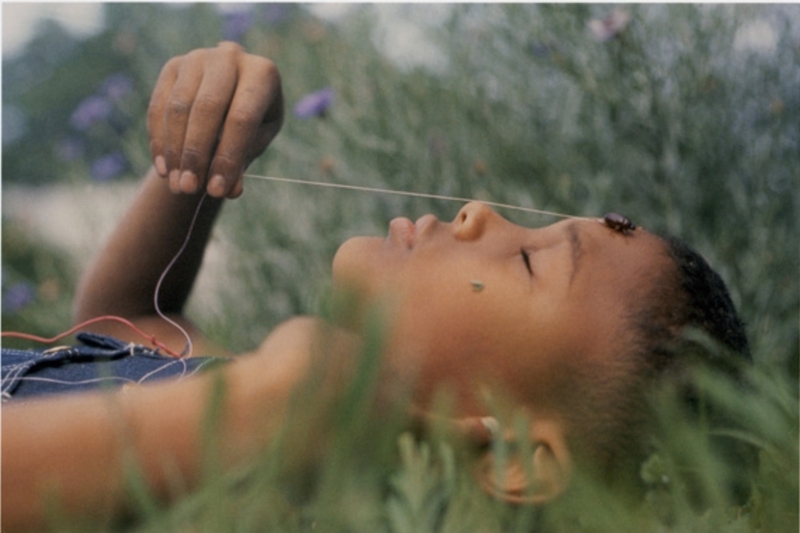 That references 1963’s “Boy with June Bug,” an image Parks took in his hometown of Fort Scott, Kansas, a place he once called “the mecca of bigotry.” The young man’s innocent serenity in the midst of said bigotry is captured masterfully in “ELEMENT.” with features like the blurred grass in the background and foreground showing attention to detail. Religion also plays a role in “ELEMENT.” as it did in Parks’ “Black Muslims” series. When you see several women lined up in a triangle formation (first at 0:46, and then again at 2:57), they resemble Parks’ 1963 portrait of the Honorable Elijah Muhammad’s daughter Ethel Sharrieff. The shot—which was taken in Chicago, Ill.—has influenced others, as well. It even inspired a scene in last year’s Oscar-nominated Hidden Figures. Another image that Parks took for this series—“Black Muslims Train in Self-Defense”—also comes to life in “ELEMENT.” (at 1:42). Parks was able to take these shots after meeting the Honorable Elijah Muhammad and earning his trust through Malcolm X, something that no one else at LIFE could do. Parks went on to take many memorable photos of X and the two became close friends. Parks even became godfather to Malcolm X’s daughter, Qubilah Shabazz. Coincidentally, Parks’ “Black Muslims Rally” picture (taken in Harlem, New York in 1963) also looks like it inspired a scene in “HUMBLE.” Clearly, inspiration runs deep. Violence is also a prominent force in “ELEMENT.” One fight scene in particular (at 2:04), resembles a set of flicks depicting a brawl on the streets of New York. It was taken for “Harlem Gang Leader,” Parks’ first-ever assignment at LIFE. He took these shots while following Leonard “Red” Jackson, a 17-year-old leader of The Midtowners gang, for the article. Nearly 40 years later, Parks published a letter from Jackson in Voices in the Mirror: An Autobiography. “I would like to reach out to [the youth] and tell them how quickly glory faded from me, that there’s a much better way to go,” wrote Jackson. “I might wind up saving some of them. Even one would be worth it." “ELEMENT.” has other subtle references to Parks’ work, like silhouettes, which were often part of his repertoire. There’s also a handcuff scene that looks a lot like a photograph that’s been attributed to Parks. All of this only adds to the “ELEMENT.” of symbolism in Kendrick’s work.